Since we live in the St. Louis area, our house was on the edge of totality for the 2017 solar eclipse. For our oldest child, that was enough. 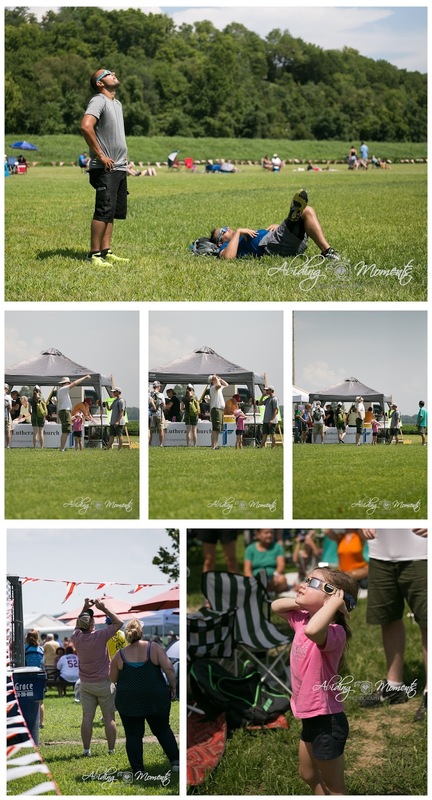 His school was in session and had plans to safely view the eclipse outdoors, so he had no interest in going further to get a longer time in totality. 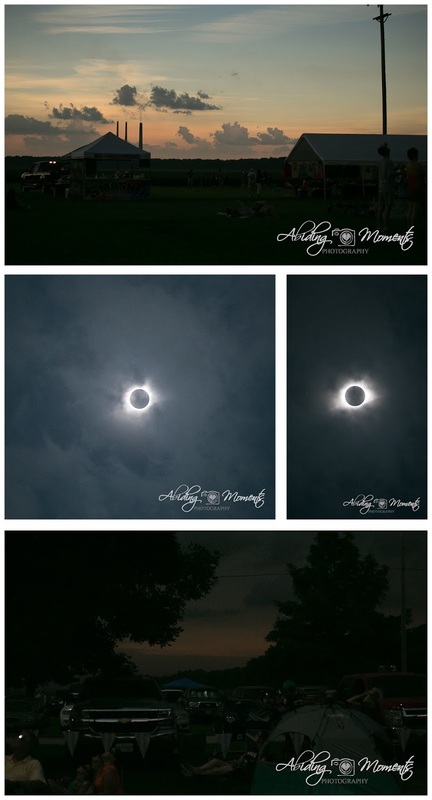 For my husband though, home wasn't enough and he took us about 30 minutes south so we could get an extra 90 seconds of totality. Honestly, I thought it was a little silly. I remembered seeing an eclipse as a kid through a shoe box - it wasn't all that eventful. I had pretty serious doubts about this one being all that exciting either, but I was looking forward to spending extra time with my husband and daughter. And since I was more interested in the time than then event, and also knew many photographer friends would be putting out amazing pictures, I opted to not buy a solar filter for my camera. I had a half second regret this morning and made a last ditch effort to call before we drove out, but the sales person and I both had a good laugh about my request when he said they had been out for weeks. 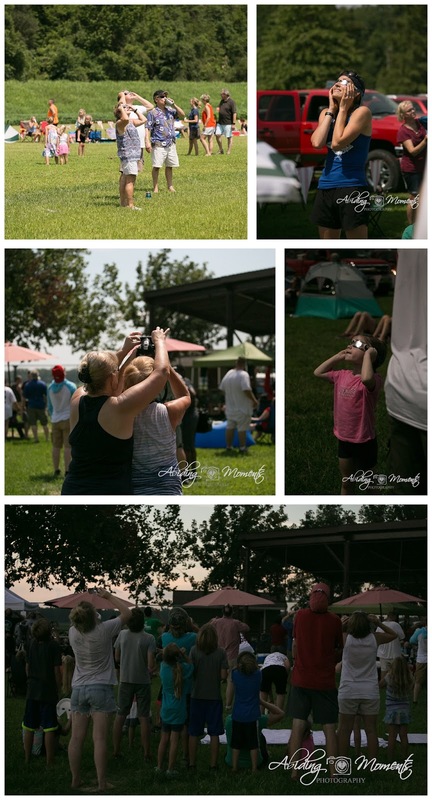 I decided to shoot the people watching and hope for a fun shot or two during totality where I knew I could take off my glasses. The location we went to was like a tiny festival. There were shirts, food tents, and people hanging around with friends and family. Of course, with festivals comes sweet treats, so my husband and girl got to indulge in what my daughter called a "swushie" (snow cone) while we awaited the moon's appearance. 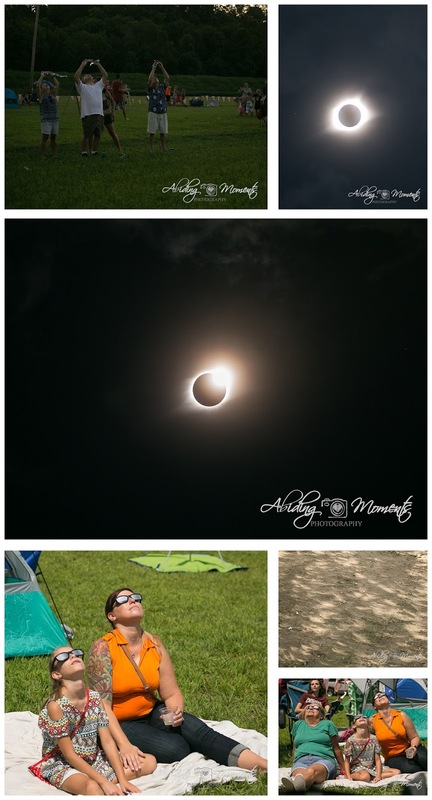 It was fun to see people's response to the eclipse. There were people that were prepped for a major tragedy, and I'm sure could have been abandoned on the interstate for days and been fine. Then there were people all around us scrambling for glasses this weekend (our family included). And although we were warned to make sure and fill gas tanks before leaving home due to crazy traffic, I may have been calculating miles and gas left in my tank when we got stuck in traffic on the way back - serves me right. Other people seemed to come and go with the shirts on their back. Since we live along the Katy Trail, there were tons of people that came and went on their bikes as well. It was really cool to see the difference. What was the most cool thing about the eclipse was to watch night take over in the middle of the day. Hearing that it will happen is different than experiencing it yourself. You could see the light becoming more of a foggy shadow and the sky changing colors. Watching the light on the horizons was pretty awesome. 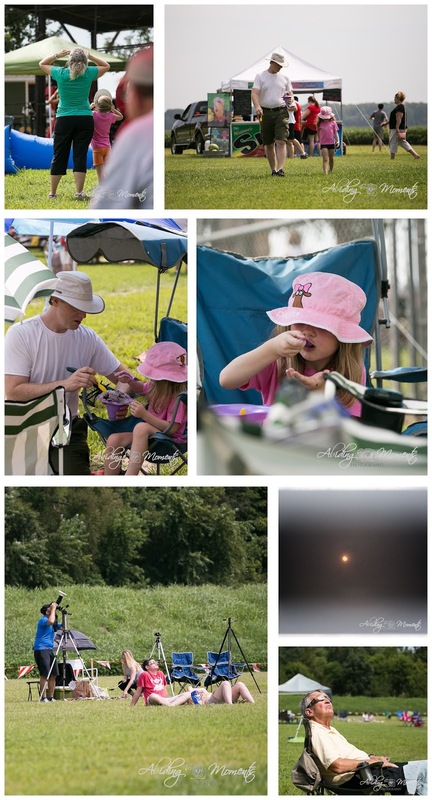 I made sure to shoot both sides of our area when totality hit and the glasses came off because it really was that cool. And the sun was even cooler. It was so surreal to be in the midst of so many things my body said didn't go together: dusk, nighttime sounds, mid-day on my clock, a couple of stars in the sky, all next to a flaming circle of light covered in mid air. So incredible. Just as fast as it started, it was over, and the sun returned. Of course, there was still plenty of partial eclipse to be seen, including shadows of the sun on the ground, but that seemed like a let down compared to what we had just seen. I hope your family got to see a little bit of the eclipse and watch how cool it was to see God work His magic. So, it's August. That's crazy. How did that happen? Summer just started, didn't it? Didn't I just have to set down some new rules for how to manage all of our free time (and save my sanity)? And now - it's ending? It just doesn't seem possible. It also doesn't seem possible that school is a few weeks away and my husband and big kid are prepping for their 6th Moonlight Ramble (a yearly midnight bike ride downtown sponsored in our area each year). To get themselves ready for their 10 mile ride, they decided to take a trek around Creve Coeur Lake for the evening. 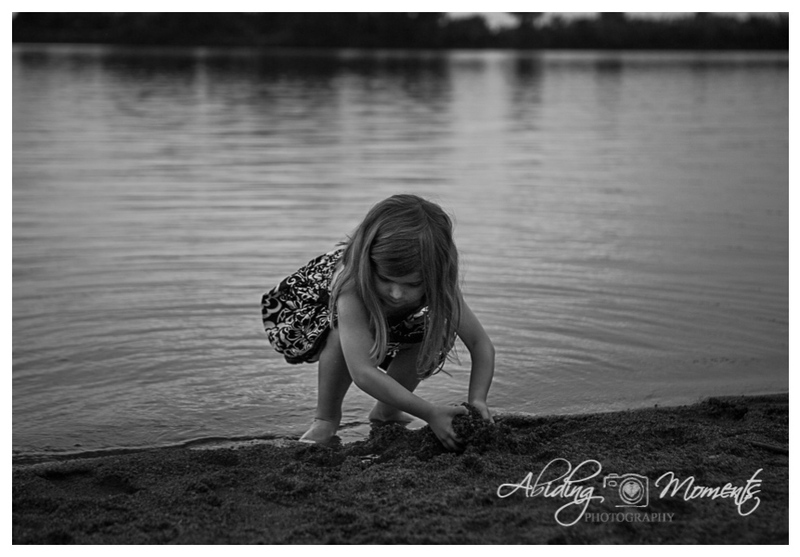 My girl and I tagged along and my husband said he figured I could bring my camera and we could play. While a sweet thought, I almost left it at home. My back log is terrible and thinking of adding more to the list seemed like a bad idea. But, I decided I would rather take it and decide against it, than the other way around. I'm so glad I did. I want to get real for a minute, because sometimes it's easy to overlook and think that pretty pictures mean life is perfect. I had no big plans for these pictures - I was shooting for myself and for fun. My girl's hair was a knotted mess from her earlier nap. 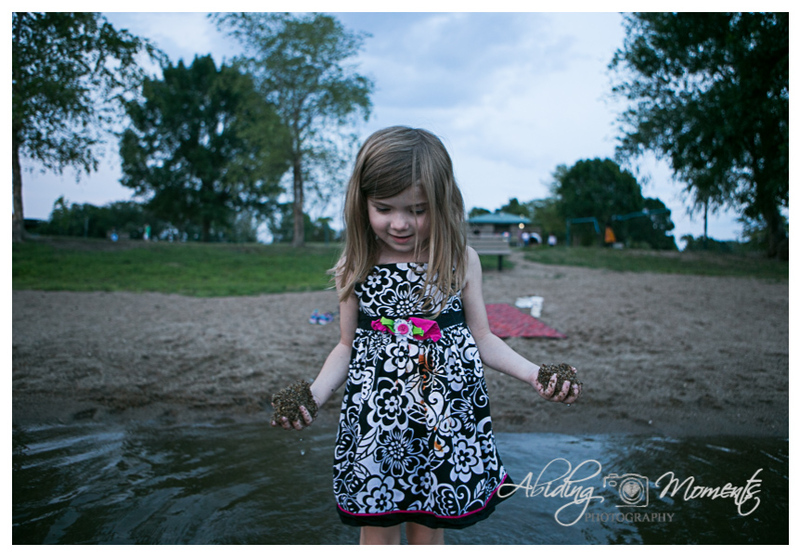 Her dress (which she has adored for way too long) is way too short and long overdue for the donation pile. And well, she's 4. Messes happen. Like this night, when my big girl put her orange flavoring in her drink all by herself - and squeezed it straight all over her dress. I could have said never mind. I could have left the camera in the car. But really, and maybe it's just me, I'm kind of over perfect. My kids grow, and their clothes shrink, so there's that. Stains happen, hair gets messy, but my kids - they'll never be the same again. Soon enough, the stains will be less and less, my girl won't need me to brush her hair (or be taking naps), and that sweet little dress will no longer be a part of her wardrobe. So, I try to roll with as much as I can handle. 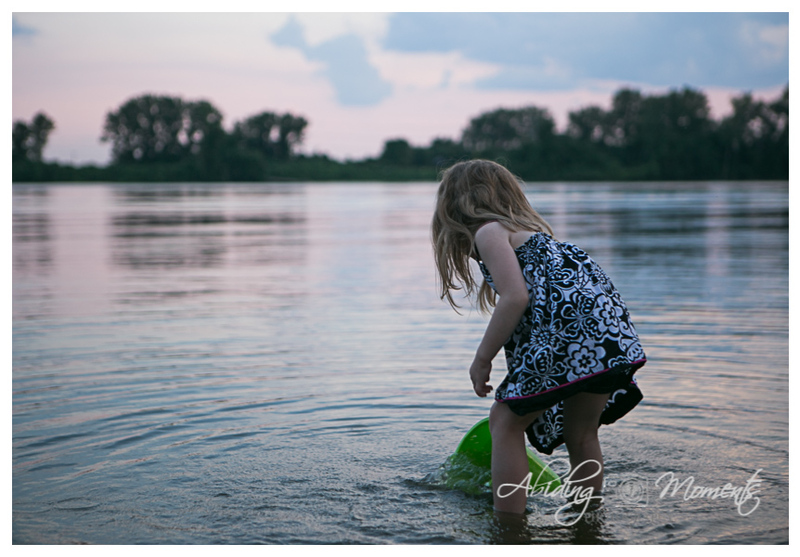 So, here's my girl, playing at the lake, in a stained dress, that was too short, slightly after sunset (the photographers all gasped), and a set of images that I am in love with. I hope you love them too. I love to have the honor of sharing this circle with some amazingly talented photographers that are part of the documentary world. If you haven't ever taken the time to circle through, I highly recommend you do. Amy is a Portland, Oregon Documentary Photographer and her work is one that you don't want to miss.